Another 3 wins & 32 nominations. As I was walking down the stairs and out of the theater, I was trying as hard as I could to pull a smile out of my face. My friends tensely asked if I liked it, I said "Yes, of course!!" They nodded weakly in response. On the way home, I kept thinking to myself. "You liked it! C'mon! It's Spiderman!" Now, it's two days later, the euphoria of waiting for Spidey to come out has subsided, and I've begun to look at this flick a bit more (shall I say it?) critically. It's plain to see that Sam Raimi is a fantastic director. He knows when to do what and realizes that he is making a superhero movie, which is why the Spider-man movies have done so well. It's not like the recent Batman and Superman who try to hide the fact that they're just fun superhero films. Raimi knows his material and embraces it. The effects were astounding as usual. Spiderman's one-on-one fight with the Sandman and the crane scene being the major highlights. I thought these features would outbalance the weaker spots of the film, but unfortunately they did not. As far as acting goes, I'm surprised to say that Topher Grace stole the show. I remember how outraged everyone was when he was chosen, but obviously someone knew what they were doing when they let him on as Venom. James Franco and Kirsten Dunst played their usual selves (I can't help but think of Dunst dreaming of getting back to work with Sofia Coppola while doing these films). However, Tobey Maguire REALLY disappointed me. I've always thought he was so great at Spidey, which is undeniable in the first two films and even in this one...when he has his red suit on. 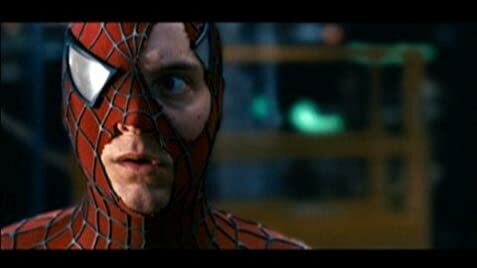 Maguire is a one note actor, at least as far as Spidey goes. He just could not pull off the black suit; he wasn't good at being bad. Then came the horrific bridge scene with MJ. Along with most other people I've talked to, my entire theater erupted in laughter when he started crying. It was just...sad...and not in the way the writers intended it. Speaking of the writing, I hate to be beating a dead horse, but c'mon: 3 villains, Sandman's background, trouble with MJ, Harry's changing attitudes, 2 different Spidermans, competition at the Bugle, Gwen Stacy, etc. It was just WAY TOO MUCH! Even if you had four hours, it's just too much to cram into the audience in one sitting. The great thing about Spiderman 2 (the best of the trilogy) is how focused it was. You had the inner struggle, the villain and his relationship with MJ. There it was! Beautifully filmed and written. From the first 15 minutes of Spiderman 3, I knew that all these parallel story lines were going to crash within the next two hours. The sequence that shows how far they've fallen from part two is the whole emo/hair in the eyes/eyeliner/oh so cool "bad" Spiderman scenes. The first few minutes of this was funny in the same way that the "Raindrops are Falling on my Head" scene in part two was great, but this time they stretched a good thing way too far. This whole sequence is what sticks in my mind and refuses to let me think that the film was just as great as the rest. I tried to like it! I really did! I just can't fool myself any longer. Some critics like Peter Travers for Rolling Stone are saying that we can let this one slide because it's Spiderman, but I couldn't disagree more. Spiderman 3 missed the mark and, deep down inside, we all know it. This was Cliff Robertson's final film before his death on September 10, 2011 at the age of 88. Kid in Times Square: Hey look, it's Spider-Man! Peter Parker: People really like me. A part of the movie features the Cleveland Trust Rotunda in the background where one can easily read "Cleveland Trust" inscribed on the Romanesque structure, although the movie is supposed to be set in New York city. Two other unique Cleveland landmarks are also briefly visible - Terminal Tower, and the marquee entrance to Playhouse Square Center. During the opening credits, snippets from the first two films can be seen. Also, some of the filmmaker's names appear and then blow away, as if made of sand. The black symbiote also makes a brief appearance. In 2017, in anticipation for Spider-Man: Homecoming, Sony released an "Editor's Cut" of Spider-Man 3. This cut mostly utilizes an unused score, alternate edits of scenes, a restructured story, and scenes both added and removed throughout. With all of these changes, this version runs 2 minutes shorter than the theatrical version.